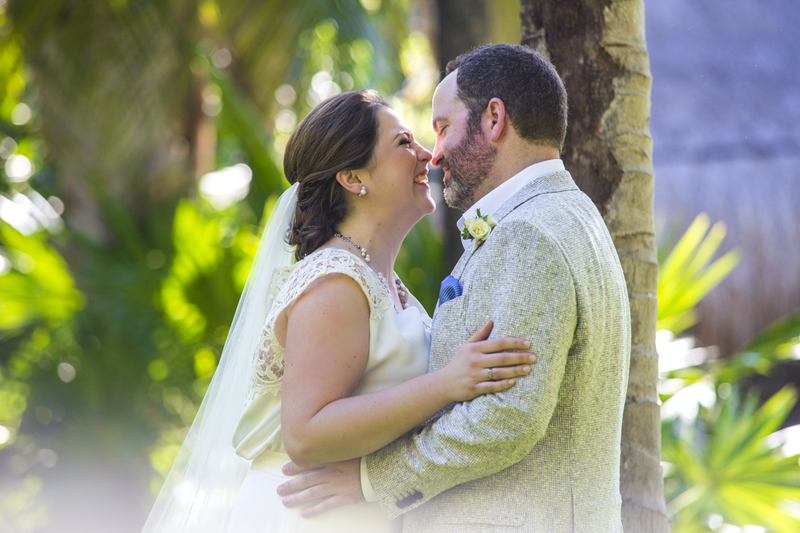 Kyra & Ted are Fun In The Sun Weddings’ newest newlyweds! Some would call it a miracle that a girl from Syracuse University and a boy from Virginia Tech would end up living happily ever after. Kyra and Ted met through a mutual friend who invited Kyra to a dinner party at Ted’s place one fateful evening. He opened the door wearing a Virginia Tech tee-shirt. “You might not want to let me in,” she said, “I went to Syracuse.” He laughed and was hooked. When the time came to get engaged, the couple snuck off to a beachside cabin in Mendocino County. On their first night there, they went outside to watch the sunset. Ted chose that perfect moment to get down on one knee and propose. They wanted a wedding that was simple and elegant, and they didn’t want to obsess over the little details. This was achieved with the help of one of the best wedding planners in the area, Natalia Schweitzer of Weddings On The Beach. Working from a simple photo of a table setting and bouquet that Kyra liked, Natalia helped them to choose shades of orange as their color palette, which looked amazing against the tropical turquoise and ivory backdrop of the Caribbean. Kyra was transformed into a Beach Princess by none other than Beso Brides, and their wedding reception was kicked up a notch with a Photobooth from our partners at Mayan Riviera Photobooth. The bride’s advice for the future brides-to-be getting married on the beach? Don’t fight over the small details because no one will notice. The worst thing that could happen is that you don’t get married! Kyra and Ted, it has been such fun working with you, and we wish you all the best things in life as you start this new chapter of your lives together. Congratulations! And if you are looking for the best Tulum wedding photographers for your beach wedding, then get in touch with us today! We are Fun In The Sun Weddings, the best wedding photographers in the Riviera Maya, Mexico. Want to know more about Al Cielo on Xpu Ha beach? It is now permanently closed, unfortunately, but you can learn more on Tripadvisor here. We had so much fun working with you guys!!! !